For nearly ninety years Pluto was our ninth planet. 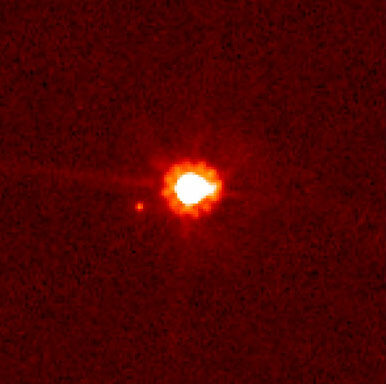 Then in 2006, much to the annoyance of some, it was no longer a planet, but a dwarf planet. What happened? 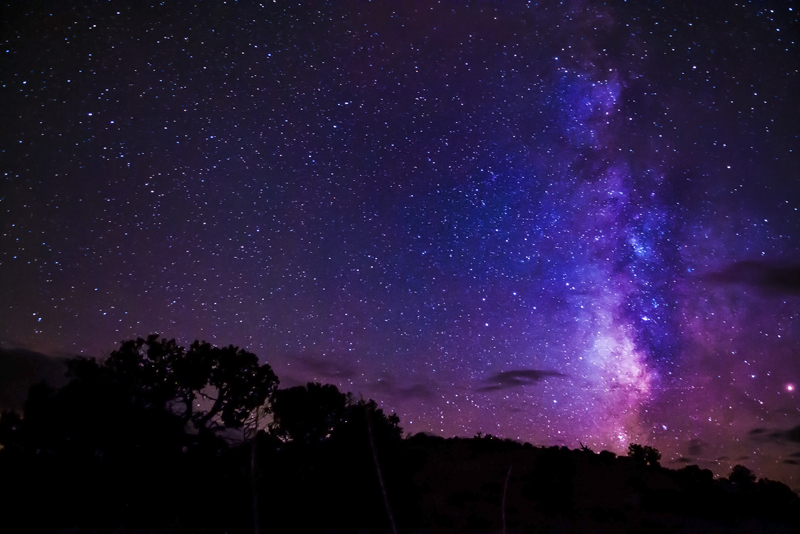 The story began in 1930 at Lowell Observatory in Arizona where Clyde Tombaugh discovered Pluto. He was searching for Planet X, a large planet beyond Neptune. Percival Lowell had predicted its existence to account for disturbances in the orbits of Neptune and Uranus. In fact, Pluto was far too small to influence these massive planets. So what about Planet X? It took nearly sixty years to solve the mystery. In 1989 the Voyager probe measured Neptune's mass. With this value for the mass, there were no unexplained disturbances in the orbits of either Neptune or Uranus. There was no Planet X. But Tombaugh had found something far more interesting, the first Kuiper belt object, though no one would recognize it as such until the end of the century. The Kuiper belt (named for Dutch-American astronomer Gerard Kuiper) was a theoretical idea, an extensive belt beyond Neptune populated by comets and icy asteroids. It stayed a theory until 1992 when David Jewitt and Jane Luu discovered a Kuiper belt object. By July 2015, over 1650 such objects were listed by the Minor Planets Center. The Kuiper belt extends from 30-50 AU, an AU being the Earth-Sun distance. It contains tens of thousands of bodies over 100 km (60 miles) across and millions of smaller ones. Two larger bodies, Haumea (HOW-may-uh) and Makemake (ma-kee:ma-kee), were found there too. In 2005 Mike Brown, Chad Trujillo and David Rabinowitz announced their discovery of a tenth planet. The team had nicknamed it Xena after the warrior princess heroine of a popular American television series. It seemed to be larger than Pluto, so they – and also NASA – assumed that if Pluto were a planet, so was Xena. But then some people wondered if Haumea, Makemake and the asteroid Ceres could also be considered planets. It seemed that the Solar System might have thirteen planets and room for more. In 2006 the General Assembly of the International Astronomical Union (IAU) debated proposals for defining planets and moons, including introduce a new class of object, dwarf planets. 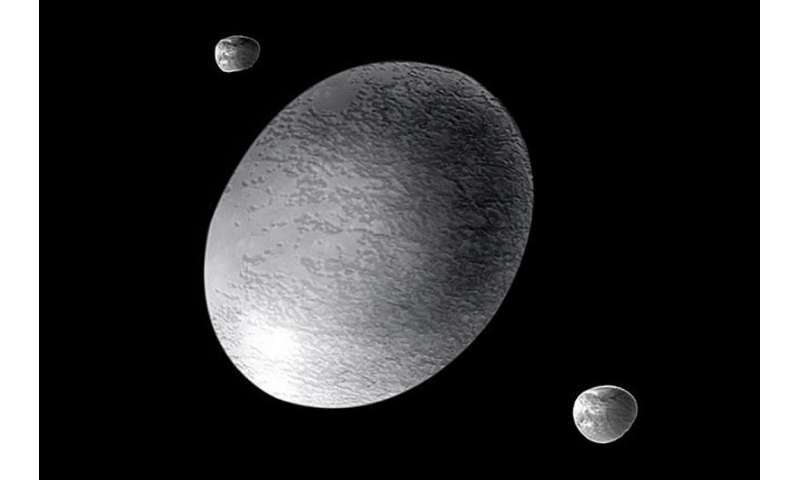 These proposals would make Pluto, Haumea, Makemake, Ceres and “Xena” dwarf planets. Debate in the General Assembly was heated at times, as it was in the community at large. The IAU did accept the new definitions, but there are still aggrieved dissenters. After its fame as a new planet, the new dwarf planet got a number plus the discovery team's proposed name: Eris. But what do we know about Eris? Eris is so far away that it's not even in the Kuiper belt, but in an area beyond it called the scattered disk. Its year is 561 Earth years long. Its orbit is very elliptical, varying from 38.5 AU to 97.6 AU. Here is the orbit of Eris compared to those of the outer planets. The diagram can't show clearly how steeply tilted Eris's orbit is: 45° to the ecliptic. The ecliptic is the plane in which the planets, main belt asteroids and many Kuiper belt objects orbit the Sun. The temperatures on Eris can only be estimated. You won't be surprised that the estimates are very low. 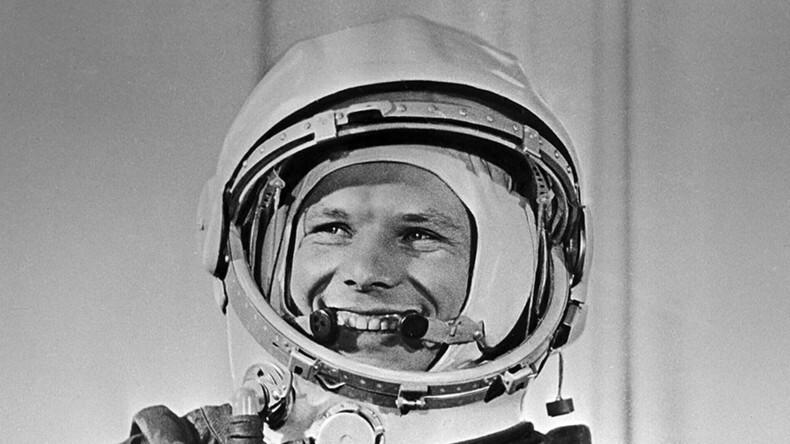 During one orbit, the temperature would vary from from -243 to -217 °C Celsius (-405 to -359 °F). At its closest approach to the Sun the frozen surface probably sublimes (turns into a gas), exposing a rocky surface. However that prediction can't be checked for over two hundred years. Here is the best available image of Eris – it's from the Hubble Space Telescope. Despite lack of detail, astronomers can observe Eris's moon Dysnomia. This is important. It means that we have an accurate value for Eris's mass, because the mass of an object is calculated through its gravitational influence on other bodies. Although we knew the mass of Eris, its size was uncertain. The discovery team originally calculated that it was significantly larger than Pluto. However a more precise measurement showed Eris and Pluto to be much the same size. In July 2015 New Horizons provided a definitive diameter for Pluto and it turned out to be slightly larger than Eris. This tells us something intriguing. Forget those who call Pluto and Eris twin planets. They're the same size, but Eris is 27% more massive. This says that their composition is different and therefore their origins differ. No one knows why Eris is so dense. I mentioned that Xena was Eris's nickname, but the name Eris itself refers to the sister of Ares, the Greek counterpart of Mars. She was the goddess of strife and discord – Eris managed to start the Trojan war. Her daughter was Dysnomia, described as “the Daimon spirit of lawlessness.” Admittedly, the planet debate wasn't war, but the name was surely an ironic comment on it.